Haydn’s Op.50 (Prussian) String Quartets are amongst his finest musical creations, and yet are relatively unknown, apart from the two given the later nicknames of The Dream and The Frog. Composed in 1787, the set was dedicated to Frederick William II of Prussia (apparently in return for a gold ring sent to Haydn by the King), hence the nickname. The fact that he played the cello might explain the opening of the first quartet, with its solo cello repetition of notes. The six quartets are perhaps less immediately appealing and populist than his earlier Op.33 set, and seem to feature Haydn in a more intense and, perhaps, more intellectual mood. The movements usually only explore one theme, perhaps suggesting that Haydn wanted to concentrate on the developmental possibilities of a single theme. Although each has the same four movement format, they are all very different in style, notably the 4th, in the dark key of F# minor, and with its curiously intensely wrought final fugue. They have an interesting history, not least because of Haydn’s rather sharp practice of convincing publishers in both Vienna and London that they were the only publisher. The story of the discovery of the autograph manuscript is also fascinating. The manuscripts of the last three had been purchased by an English Colonel who then emigrated to New Zealand. They were passed down through the family, with nobody realising that they were the only surviving originals. They were presented to Christopher Hogwood in a plastic bag during a Haydn festival in Australia in 1982. 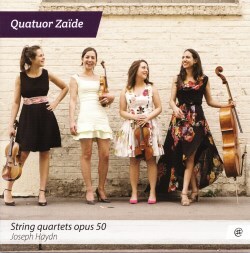 Quatuor Zaïde was formed in 2009, and quickly won several prizes, including the International Hayden Chamber Music Competition in Vienna in 2012. The young members (Charlotte Juillard and Leslie Boulin Raulet, violins, Sarah Chenaf, viola, and Juliette Salmona, cello) have a very refreshing approach to the music, accenting the widely differing moods of the various movements and delighting in Haydn’s frequent touches of humour. They are not afraid of explores dynamic extremes at both ends, or of adding personal touches to such aspects as articulation. One interested aspect of the latter comes in the final movement of The Dream (No.5) where the slurred violin leaps are played portamento (or glissando), sliding from one note to another, in this case over intervals of a third and fourth. This is a reasonable interpretation of a slurred leap, although it is not applied consistently to other slur markings in the movement. But I think it is a nice touch, and works well. Throughout, there is a wonderful sense of discovery and exploration. This is excellent playing of music that should be better known.